The above ad is from F.X. Matt Brewing in Utica, NY, in 1964. It appeared in June that year in the Fairport-Herald-Mail in Fairport, NY, see source here. Matt’s is one of the few old-regional breweries to transition fully to the new craft era. With roots in 1800s German-American brewing (see this earlier post for more Matt’s history), it survived into the 1980s partly due to its isolated location in regional New York State. Genesee Brewing in Rochester is a somewhat similar example. Like Matt’s, it introduced a successful line of craft-style products to appeal to a new generation of beer consumers, and like Matt’s again, also does contract brewing. Yuengling, Straub, and Lion Breweries (all Pennsylvania) are similar survivals but their products tend to the pre-craft in profile. Matt’s reinvented itself from the mid-1980s as a craft brewery with its Saranac line under tutelage of brewing maven Joseph Owades. We recently discussed his vital yet under-appreciated role in the craft revolution in this post. One of the reasons family-run Matt’s was able to make the transition noted was, it never lost an understanding of the brewer’s importance – simply put of the beer palate. True, all was relative in the pre-craft days. Still, from the ad above and others of the same period I’ve discussed you can see that Matt’s focused on the product in a way that wasn’t just marketing flim-flam. 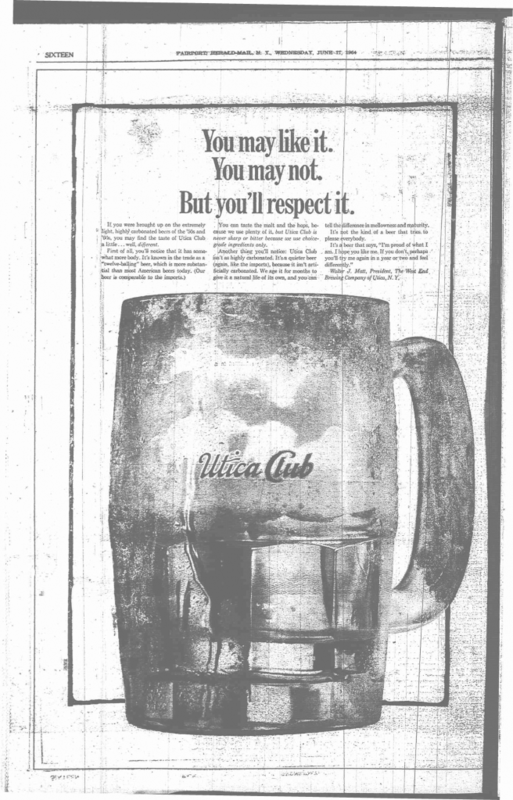 The ad above states, unusually for the time or even our time, that Utica Club pilsener is a “twelve-balling” beer. It made the claim of superior quality due to the beer being “substantial”. I think the company was saying, the starting gravity of this beer is 12B or 1048 on the more commonly referenced scale today. Since almost all U.S. lager then was just under 5% ABV, I’d think Matt’s was finishing the beer at 1012 gravity for an abv of 4.7%. Or perhaps the final gravity dropped a shade with abv going slightly up. Since the competitors were selling beer at virtually the same alcohol content, I’d infer many of them were starting with a lower gravity. If you started at 1042 you could finish at 1006 with virtually the same alcohol as in my example above but a rather drier palate. So I think Matt’s was saying, our beer tastes richer in comparison. Also, the ad refers to beers of the “50s and 60s” – we are only in 1964 – as “extremely light and highly carbonated”. That’s a pretty telling statement in the pre-craft era. It’s exactly what the first beer book writers stated from about 1975, 10 years later. Many in the pre-craft beer industry were ready to acknowledge what Matt’s did, and I’ve documented examples earlier, but not to the public! It was pretty ballsy of Matt’s to do that in 1964. How do pre-craft reviews read? Jim Robertson’s first The Great American Beer Book, issued in 1978, describes the beer in no special terms: “… aroma of Concord grapes and corn …light malty vegetal flavour, neutral finish”. Yet, the relativity factor may explain that: Uncle Charlie, as the beer is or was known in Upstate New York, is no Lowenbrau much less Brooklyn Lager, but maybe it rocked in comparison to Schlitz and Bud. Is there any reason to think Utica Club pilsener tasted better than the mass-market competition? Actually, there is. It’s not conclusive, it’s not even the usual type of source one would use, but it’s some evidence. 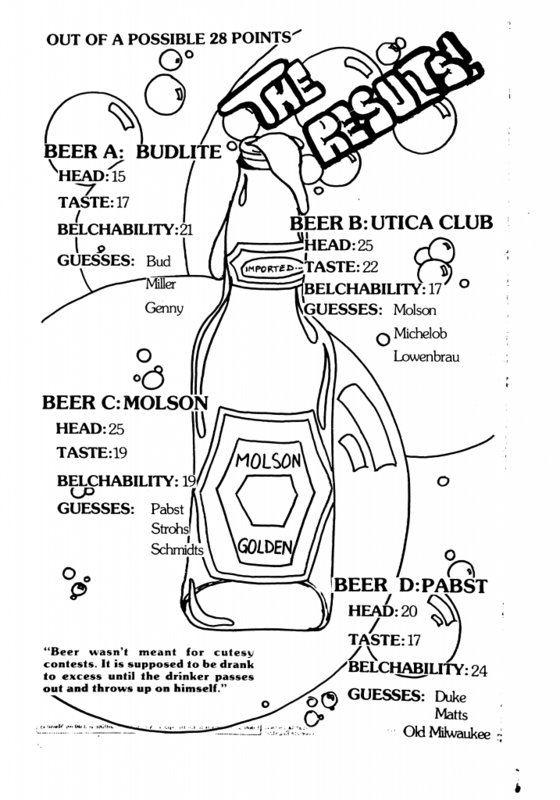 The student newspaper of the Oswego campus of SUNY, or State University of New York, reported the results of a blind beer-tasting in 1985. The account is written – the term is used advisedly – in an intentionally-exaggerated “obnoxious” style. Think old John Belushi movie, that was the tone of much campus humour then. The handful of brewpubs and craft breweries in the country hadn’t penetrated the college scene let alone the public mind as such. Of course too beer, the quintessential popular drink, only encouraged such derisive, backhanded treatment. Indeed the attitude still persists, hence the salutary injunction of the rating service Beer Advocate: Respect Beer, a formulation that oddly, or perhaps not, echoes the 1964 Matt’s ad. To read the full student report see here from the Oswegonian of March 14, 1985. I can’t say it makes uplifting reading. But it does give a snapshot of beer’s campus role then and the frat house-style hilarity that is now infra dig. So he must have had something, old Uncle Charlie. Matt’s would have been pleased even if the tone of the piece hardly bespoke the respect for beer Matt’s promoted well before the first glimmers of a beer renaissance. Utica Club pilsener is still made by Matt’s. Current reviews are so-so but of course the bar has moved, so to speak, in 40 years. Also, given that the nourishing Saranac beers are the main output now perhaps Uncle Charlie has been put on a diet since his heyday. But my point remains: Matt’s cared about good beer at a time most American breweries thought about a million other things first: brewing technology, business systems, marketing, logistics, etc. Not that these other things aren’t important, they are, of course. But caring about the beer finally ensured Matt’s survival and good health today. The same could not be said for the many breweries of the 1960s and 70s, now closed, for whom the beer came last. Note re images: The images above were sourced from the respective news stories linked in the text. All intellectual property in the sources belongs solely to their lawful owner, as applicable. Images used for educational and historical purposes. All feedback welcomed. *It’s true that one of the four beers was a light, the Bud, but still, Matt’s beer bested two full-strength beers, one a generally well-regarded import. Also, light beer manufacturers always stressed that their beer tasted great a la “all you want in a beer, and less”, so the fact of a light beer being included in a tasting of this nature should not be held against the winner. I tried Utica Club (UC) Beer and Cream Ale in the late 70s. By that time, I think they might have “caught up” to the prevailing light flavor profiles. We lived on the edge of the marketing area (Long Island, NY), so freshness might have been an issue. At that time the cream ale had very little character and was inferior to several US offerings including my favorite (at the time), McSorleys. Regarding standard lagers, I preferred Schaefer (especially draft), Pabst, and Schmidts to UC Beer. I think the UC Cream Ale might have been upgraded in the 80s after contract brewing began. These days, I admire most of the Saranac beers and ales that I get a chance to try. I have a comment regarding the Canadian offerings in the US in the 70s. I thought Carling US products (especially Tuborg) were uniformly better than Canadian Carling. I also feel that Molson US products weren’t distinguishable from mainline US beers. I thought the Labatt’s brews at the time were generally higher in quality. Thanks Arnold, all very interesting. Of course that’s Jonathan Winters in those tv ads, wonderful stuff. Winters had trouble with booze but I think he had stopped before these productions. My recollection of UC beer (lager) is like yours, and dates from the same period. I’d have gotten it in Albany at that time. I don’t think freshness was a factor and after all it was pasteurized (the bottled and canned). I liked Schaefer too, I recall a good bitterness in the finish. I also liked PBR, which had a subtlety it’s long since lost I think. The cream ales (of any of them, Genny too) not so much: acidic, sharp, too light. Even 12 Horse Ale was never that great when I had it. Carling national was the second largest brewery in America in the 1960s, so no surprise it made good stuff. Jim Robertson talks about U.S.-sourced Molson vs. the Canadian-bought beers. He liked the Canadian ones more but thought freshness was a factor and quoted the exporter that the beers were identical. The Labatt beers certainly for years sold very well in Upstate too, especially Labatt Blue. At that time, they were in fact heavier-bodied and better than the U.S. beers, but that difference evened out in later years.